Extensive green roofs were originally developed, tested and evaluated in the temperate climate of western Europe, which is typified by warm summers with frequent rains and cold winters. Eastern North America shares a relatively similar climate, if somewhat more extreme. The climate of the Pacific North-West, however, is dramatically different from both of these regions. Here, our summers are hot and dry, and our winters mild and wet. 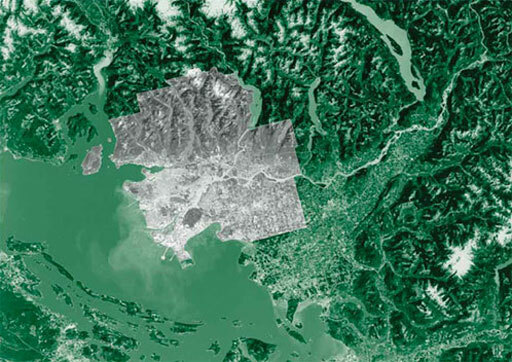 Metro Vancouver (highlighted area) is bounded by the Strait of Georgia to the west, Coast Mountains to the north, Fraser Valley to the east and the U.S. to the south.